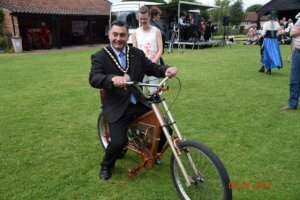 Seventeen events were attended by the Mayor, and one event was attended by the Deputy Mayor during July 2017. Sunday 2nd July 2017 – Attended the Butterfly Hospice Trust Butterfly Release at the Crown Hotel. 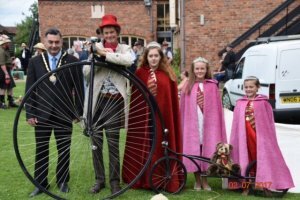 Sunday 2nd July 2017 – Was present at the Steam Punk event held at The Village, Church Farm Museum. Monday 3rd July 2017 – Attended an event at Skegness Academy to showcase the pupils work in the arts. Friday 7th July 2017 - Presented trophies at the Magna Vitae Bowling Tournaments held on the North Greens near the Suncastle. 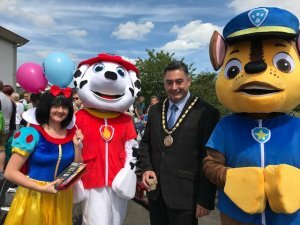 Saturday 8th July 2017 – Opened the Beacon Primary Academy Summer Fair. 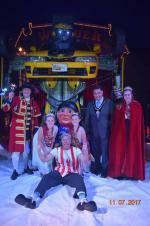 Tuesday 11th July 2017 – Attended the opening night of Mr Fipps Wonder Circus. Friday 14th July – Presented awards and certificates to the Cobra Ju-Jitsu Club students. Saturday 15th July 2017 – Welcomed the 70 riders who took part in the Annual Skegness Bike Ride from Nottingham to Skegness and presented medals to the riders. Saturday 15th July 2017 – Was a judge for the Skegness Carnival Queen, Princess and Rosebud competitions held at the Suncastle. Thursday 20th July 2017 – The Deputy Mayor, Councillor Sid Dennis cut the ribbon to open a public garden at Lincolnshire Regional College. Thursday 20th July 2017 – Attended the National Citizen Service Closing Ceremony at The Village Church Farm celebrating local young people's work renovating the sensory garden at Church Farm as part of their National Citizen Programme. Friday 21st July 2017 – Attended the BBC Radio Lincolnshire 10,000 Lives Campaign at the Hildreds Centre where the 10,000th person of the campaign was trained in CPR. Friday 21st July 2017 – Opened the new Skegness Town Football Ground. Saturday 22nd July 2017 – Invited Gina Parkin who was on the Lotto advert, to look around the town and show her the highlights. Monday 24th July 2017 – Attended the performance of Dracula at the Neverland Theatre. Saturday 29th July 2017 – Attended the "Stay Safe Event" organised by Lincolnshire Police held on the foreshore near to the Lifeboat Station. Sunday 30th July 2017 – Was present at the annual RNLI Lifeboat Day celebrations. Monday 31st July 2017 – Cut the ribbon to open the new Marston's Public House and Restaurant, The Twelve Oars, on Burgh Road Skegness.